Invented and contributed by Légrády Gábor & Kápolnás György. The game requires both luck and thinking - and it is mostly for fun. The game is best for 2-6 players (never tested with more). The game requires a minimum of 110 card deck (two standard 52-card decks with a total of 6 jokers), but more cards can be added with more players. The card order from lowest to highest is: 2 3 4 5 6 7 8 9 10 J Q K A Joker. Suits do not matter. The winner of the game is the player who collects the most cards. Each player is dealt 10 cards. The remaining cards are stacked on the table face down - this is called the deck. The player to dealer's left plays first, and the play continues clockwise around the table. Start an Avalanche - the player places a single card or any number of equal ranked cards face up on the table - for example an 8, or a pair of queens, or three fives. Note - it is not possible to do both. If you draw a card (snowfall) you cannot also start an avalanche - it is now the next player's turn. Grow the Avalanche - by playing the same number of cards as the previous player of equal or higher rank, or a larger number of cards of any rank. Stop the Avalanche - if the previous player played at least two cards, play the same number of cards but of lower rank. Let the Avalanche Fall - by playing fewer cards than the previous player, or by playing a card of lower rank if the previous player played a single card. If the avalanche grows, the avalanche cards stay face up on the table and the next player must play a card or cards to grow it, stop it or let it fall. If the avalanche falls, the face up cards in the avalanche are given to the previous player - the player to the right of the one who let it fall, who stores tham face down. They are not used again, but the player who has most stored cards at the end will win the game. If the avalanche is stopped, the avalanche cards are stored face down in a neutral pile that belongs to no one. After an avalanche is stopped or allowed to fall, the next player has the choice of snowfall or starting a new avalanche. Anyone who has no cards in their hand at the end of a turn (having played all their remaining cards to the avalanche) must draw a new hand of 10 cards from the top of the deck - or all the remaining cards from the deck if there are fewer than 10. When the deck is empty, snowfall is no longer possible. If there is not already an avalanche, the player must start one. As players run out of cards in hand, they drop out of the play - their turns are skipped. This continues until only one player has cards. This last player adds all cards remaining in hand to their pile of stored cards. The winner is the player with most stored cards. 4, 9, 9, K, 3. Fallen - cards won by the player who played the king. 9, joker, 5-5, 5-5, 8-8, 6-6-6-6, 4-4-4-4. Stopped - cards belong to no one. 6, 6, 7-7, 4-4-4, Q-Q-Q, A. Fallen - cards won by the player of the queens. It's Bar's turn, and she has very few cards in hand, so she decides to get 10 fresh cards. For that her hand must be empty. To reach this goal, she starts an avalanche - which she will lose for sure. Foo takes the cards from the table as score. 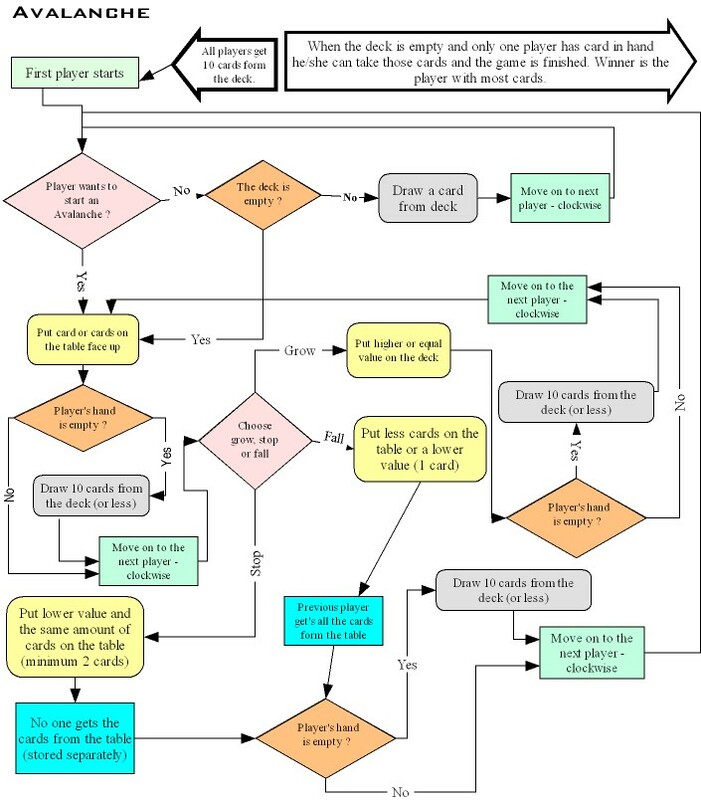 The flow chart below shows the options at each stage of the game.